Off-duty cops will no longer be patrolling inside sports stadiums and other high-risk public venues after the NYPD failed to reach an agreement over liability issues during recent negotiations. 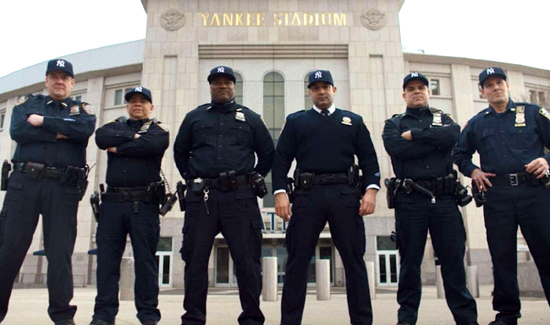 The Yankees and Madison Square Garden will use private security guards instead of uniformed NYPD officers going forward. There are several reasons for the move but the main one is the fact that NYPD officials wanted owners and companies that employ the off-duty cops to pay for liability insurance to cover lawsuits in the event their officers get sued. The NYPD also wanted the owners and companies to pay for the insurance costs of cops getting hurt while working the off-duty details. It’s a bummer for the officers who were making $45 an hour or more with a guarantee of at least four hours. Also, hanging out in the dugout seems kind of cool. At any rate, it’s truly remarkable that there’s so much revolving around police and sports right now.